I'm new to Snakeoil from Voyage MPD Linux. Thanks a lot for your great work! Look, after mounting the music folders either in different partition of the same HD, or from NAS, Snakeoil only can recognise some files in the folders. Many of folders only shows 1 music file inside. But some folders can show all. All those music files are in neither .wav, or .dsf. I can play them and display them flawlessly in Voyage MPD Linux. I noticed this recently when working on MPD - if you have a large music collection you may need to wait till the database scanning is completed before all the files are shown. Have you double checked that data scanning is completed? After some trials last night, I found it works the problem happens to those compilation albums, such as sampler, and those album with different artists for different tracks. In fact, I've already set the "album artist" of these compilation album as "Various Artist" and they work well for years in Voyage MPD Linux. So far seems those albums without different artists is fine. And I think the scan is completed. 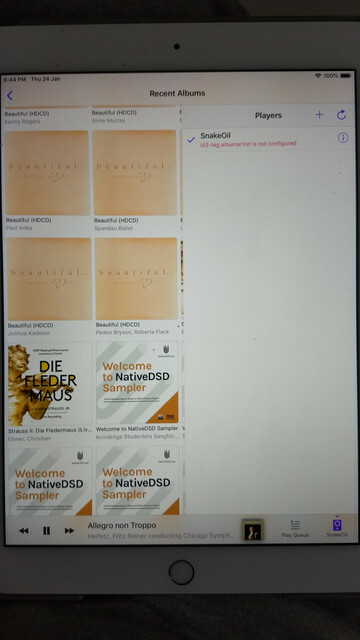 But, with android mpd client app "MAFA" https://play.google.com/store/apps/detai...ndroid.mpd . So far this app can show all the files normally. I'm not sure what is happening. Just a layman guess, I doubt it's something about the name used in "album artists". If you don't mind, would you please tell me how to solve it? Thank you very much. Thank you very much again, Snakeoil. I'm knee deep trying to recover all the computer stuffs I've lost today. Will get back to you once I get this sorted out. (24-Jan-2019, 04:17 PM) agent_kith Wrote: I'm knee deep trying to recover all the computer stuffs I've lost today. Will get back to you once I get this sorted out. 2) there could be a hint from the ipad app Rigelian, it said "id3-tag albumartist is not configured". Could it be the solution? Would you please tell me how to enable the "albumartist" support in Snake-oil MPD? I'm using V.2.0. Your help will be highly appreciated. Hi, sorry, havn't been able to get back to you quickly with this. For now, you have to modify the template files manually. Modify /var/www/players/mpd-v20/mpd.conf.template, and look for the line that begins with "metadata_to_use "
After you modified the file, restart the player from the WebGUI. And do a rescan. And you should get access to this new tag. Will look into ways to make this easier in a future release. Hey, man, seems the problem solved. I've also changed "mpd-v21/mpd.conf.template" after updated with your latest snakeoil-1.1.2-x86_64.fw. It works!! If there is any problem, I'll report to you. BTW, Thanks for your good job FW1.1.2!! (11-Feb-2019, 08:10 PM) hkphantomgtr Wrote: Hey, man, seems the problem solved. I've also changed "mpd-v21/mpd.conf.template" after updated with your latest snakeoil-1.1.2-x86_64.fw. It works!! There is at least one problem I know of. When you update the firmware, those settings will be back to the default and you will need to reedit those files. Having said that, settings like this will be exposed as GUI edit fields in the future. And once that is done your custom settings will remain when you upgrade the firmware.